Brendan Rodgers (born 26 January 1973) is a Northern Irish football coach and former player who most recently was the manager of Premier League club Liverpool. Rodgers began his career as a defender at Ballymena United, where he stayed until he was signed by Reading at the age of 18, although a genetic knee condition forced him to retire at the age of 20. He remained at Reading as a coach and then Academy Director, and continued to play non-league football at Newport, Witney Town and Newbury Town for several years. After a period travelling around Spain to study coaching methods, he was invited by Jose Mourinho to leave Reading and join Chelsea as youth manager in 2004, later being promoted to reserve manager in 2006. In 2008 he was appointed manager of Watford, where he remained until accepting an offer to become manager of his former club Reading in 2009. He left the club by mutual consent after disappointing results six months later, returning to full-time management with Swansea City in 2010. He led the club to win promotion to the Premier League, the first Welsh team ever to do so, before guiding them to finish 11th the following season. 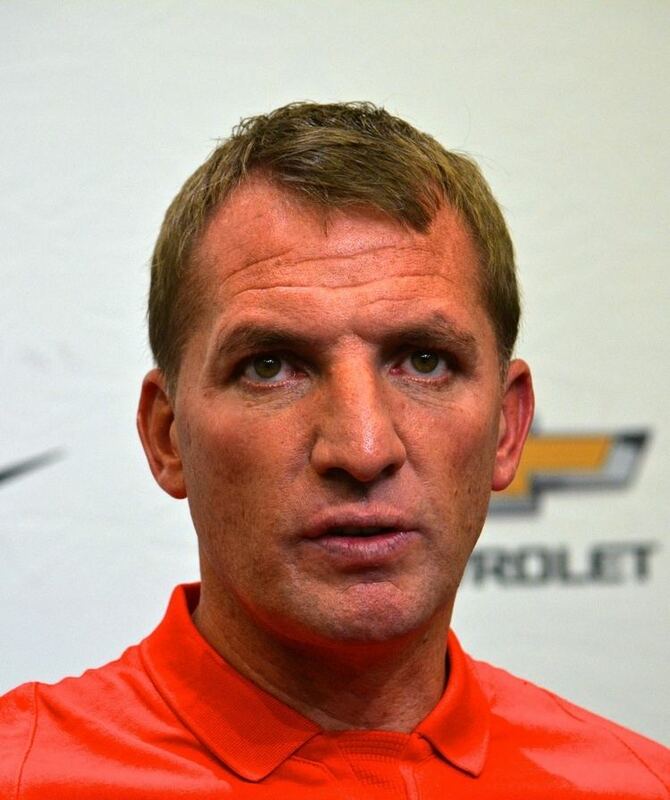 On 1 June 2012, Rodgers accepted an offer to become the new manager of Liverpool, whom he led to runners-up position in the league in the 2013–14 season before his dismissal in October 2015. His son, Anton, currently plays for Swindon Town. Rodgers was born in the seaside village of Carnlough in County Antrim, Northern Ireland. His father Malachy was a painter and decorator, while his mother Christina was a volunteer for the Irish charity, Trocaire. Brendan is the eldest of five boys. His younger brother Malachy became a well-known country and western singer locally and is now pursuing a career in Nashville. He grew up as a supporter of Sheffield Wednesday. As a teenager, Rodgers represented Northern Ireland at schoolboy level, notably playing against Brazil in 1988. He also represented the Republic of Ireland at schoolboy level. He began his senior career as a defender for Ballymena United, his local team, in 1987. He was signed by Reading three years later at the age of 18, where he played in the reserves. His professional playing career was ended at the age of 20 due to a genetic knee condition. Following this enforced retirement, Rodgers spent several years playing in non-league football for Newport, Witney Town and Newbury Town, while remaining as a youth coach at Reading. Rodgers spent a large amount of time travelling around Spain studying different coaching methods, and was eventually invited by manager Jose Mourinho to leave his role of Academy Director at Reading and join the Chelsea Academy as their head youth coach in 2004 after a recommendation by Mourinho's assistant and future Premiership manager Steve Clarke. He was promoted to reserve team manager two years later, and was kept in that position by subsequent Chelsea managers Avram Grant and Luiz Felipe Scolari. On 1 June 2012, Rodgers was unveiled as the new Liverpool manager on a three-year contract, following the departure of Kenny Dalglish two weeks previously. Rodgers' appointment was immediately endorsed by former colleague and Real Madrid manager Jose Mourinho. In July 2012, Rodgers wrote an open letter to the Swansea City supporters, thanking both the staff and supporters for his time at the club, and wishing them well for the future. Days later, Rodgers held his first training session at Melwood as the squad reported back for pre-season training. A run of eleven wins in a row for Liverpool came to an end after a 2–0 loss to Chelsea on 27 April. This result handed the advantage to Manchester City in the title race. In their next game away to Crystal Palace on 5 May, Liverpool led 3–0 with eleven minutes to go, but the game finished 3–3. Liverpool ended the league season in second place with 101 goals scored, the club's most since the 1895–96 season and the third-highest in Premier League history. Later that month Rodgers was awarded the LMA Manager of The Year Award becoming the first Liverpool manager to win the prestigious accolade in its 20-year history. Liverpool were eliminated from the 2014–15 UEFA Champions League after drawing against FC Basel in their final group match, dropping into the Europa League. The Reds were subsequently knocked out in the Europa League round of 32 after losing 4–5 on penalties to Turkish side Besiktas. On 19 April 2015, Liverpool were defeated by Aston Villa in the FA Cup semi-final. Liverpool finished the season with a 6-1 defeat to Stoke, ending up 6th in the Premier League. This meant Rodgers became the first Liverpool manager since the 1950s not to win a trophy after three seasons in charge. Despite this, Rodgers fully received the backing of Liverpool's owners. Rodgers separated from his wife Susan in the summer of 2014. The couple have two children, a son, Anton, who plays as a midfielder for Swindon Town, and a daughter, Mischa.